On his birthday, Leonard Peacock decides to bring his grandfather’s old war pistol to school with the intention of killing his former best friend and then himself. Before he does this however, he must say goodbye to the four people in his life that he cares about the most. As he says goodbye to each person, Leonard reveals more and more about his secrets and the reason for this murder-suicide. I decided to read this book because it was written by the author of Silver Linings Playbook, which I haven’t gotten a chance to read yet but I’m sure I’ll enjoy because I loved the movie. I’m so glad I picked this book up, because while it was about a dark subject, the story itself was actually very beautiful. Leonard is not the average teenager. It is evident that he has suffered a great deal more than many kids his age, and he hasn’t had a great support system to help him through his problems. His father left years ago and his mother spends most of her time in an apartment in Manhattan so that she can be close to her work and her boyfriend. This leaves Leonard by himself in his mother’s house in New Jersey, which is such an absurd parenting situation and is just plain lonely for Leonard. At the beginning of the book we learn that it’s Leonard’s birthday, and also the day he has decided to kill his former best friend and himself. Before Leonard does this however, he must say goodbye to the four people who have made a difference in his life. As Leonard says goodbye to each person, we get flashbacks of his relationship with each of them. He has a very different relationship with each of them and each has brought a different meaning to his life. He says goodbye to his neighbor, Walt, who is an old man that watches Humphrey Bogart movies with Leonard, a fellow student, Baback, who is a talented violinist, a home schooled church girl, Lauren, and his favorite teacher, Herr Silverman. Each of these people has made a huge difference in his life without even realizing it, and as he visits each one, more and more of Leonard’s past is revealed. This story is really beautiful because it shows that the briefest relationship can have so much meaning in someone’s life. It also shows how much a lack of a relationship can harm someone. If Leonard’s mother had been around more, or if she had actually put her son before her work, his life would probably have been very different. I loved the relationships between each character and Leonard and I liked the slow reveal of each character’s meaning and the stories from Leonard’s past. I honestly didn’t expect the reason behind Leonard’s intended murder-suicide, and the slow way that it was revealed really made more of an impact when I finally learned the truth. Overall, this was a beautiful story with a very important message. Leonard was a very genuine character and I felt like I was really able to connect with his story. While the subject matter is not at all light, I would highly recommend this book. 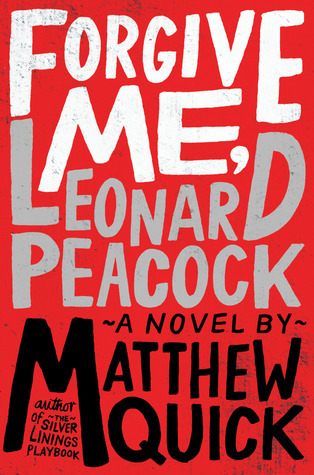 Forgive Me, Leonard Peacock was released on August 13, 2013. Thanks so much for the nomination! I no longer do award posts but I really appreciate it! !